At the turn of the century, when Fifth Avenue in the 30s was being transformed from an area of mansions to a high-end commercial district—spurred by the construction of the hulking Waldorf-Astoria Hotel on the site of the Astor houses—apartment living still carried the stigma of the tenement. One way developers evaded this taint was to build “residence hotels.” Tenants availed themselves of the freedom from maintaining a private house, enjoyed the full services of a hotel staff, and avoided being branded as apartment dwellers. 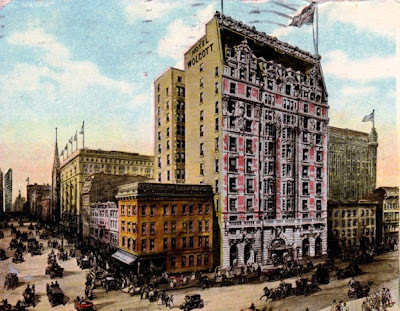 Among the first of the stylish hotels just off Fifth Avenue was the Hotel Wolcott at No. 4 West 31st Street. It was the latest venture by James H. Breslin who had been in the hotel business since the Civil War. Breslin’s extensive experience with the best hotels in New York, including the Fifth Avenue and Gilsey House Hotels, provided him with the acumen to cater to the wealthiest and most demanding of guests. Don't forget names and faces. Remember that cleanliness is next to godliness. Keep pace with the times if you can't keep a little ahead of them. Keep your old employees around you so that when old friends enter your door they will feel as though they were getting back home. The new hotel was designed by John Duncan; a twelve-story Beaux Arts confection dripping with carved garlands, heavy scrolled brackets and over-sized sculptures. One- and two-story dormers broke the surface of the towering mansard roof and the lobby was like entering Versailles. Named after Henry Roger Wolcott, a Senator from Colorado, the hotel opened on May 1, 1904. Among those looking over the 300 rooms were eminent politicians like Representative Charles Arnette Towne and former Governor Frank S. Black. The brochure at the time of the opening boasted a bathroom with every suite. “The rooms are big enough, but not too big. Comfortable, not barny,” it said. The brochure spoke of the freshness of the Cape Cod oysters and the “little chickens that come unplucked from the Jersey farms,” to be had in the restaurant. Immense carved keystones ornament the first floor windows. The up-to-date hotel offered a telephone in every room, connected to the main office, which could “connect with every other telephone everywhere." This 1907 postcard view shows that Fifth Avenue had become heavily commercialized, while brownstone homes still abut the Hotel Wolcott along 31st Street. The proximity to Fifth Avenue and the Waldorf-Astoria attracted wealthy transient guests, as well as long-time residents. On October 21, 1905 Mrs. Calderon Carlisle, of Washington DC, and her daughter checked into rooms 608, 609 and 610. The following Wednesday evening when the women attended the theater, Mrs. Carlisle wore a pair of large pearl earrings and a matching pearl necklace--this at a time when matched pearls were as costly as diamonds. The following afternoon, around 2:00, Mrs. Carlisle opened the silver jewelry box on her dresser. Her pearl earrings were gone. Further investigation revealed that the necklace, valued at around $5,000, was also missing, along with other items—a total theft of around $10,000. Indeed the victim was not of much help either. When the police heard of the crime and sent a detective to investigate, the Washington socialite “told Detective Brueck very little about the robbery, resenting what she called the interference of the police,” said The Times. On March 31, 1906 James H. Breslin died in his rooms at the Hotel Wolcott. The 72-year old had suffered from Bright’s disease for more than a year. Two years later, George T. Stockham purchased the lease and furnishings of the hotel. Stockham had been manager of the Hotel Breslin nearby on Broadway which opened the same year as the Wolcott. Among the permanent guests at the time was John Griffin Carlisle, a retired politician whose distinguished career included the post of Secretary of the Treasury under Grover Cleveland. Others included General Jose de Zayas and his wife, a wealthy retired Cuban merchant. The couple spent their winters here and summered in Paris. Robert c. Rathbone, known as the “dean of the insurance business in New York City,” lived here at the same time as Philip J. Dwyer, a “notable horse figure” in the city. 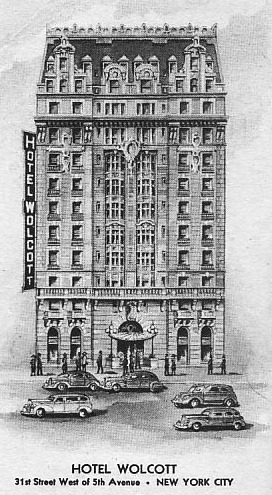 Despite the somewhat less-than-genteel atmosphere of baseball talks, the Hotel Wolcott continued to be a destination for wealthy travelers. And it also continued, therefore, to be attractive to jewel thieves. 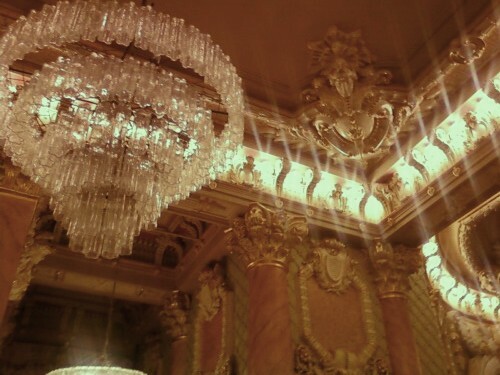 The lobby gushes with rococo ornamentation. On April 19, 1920 John A. DeKay, editor of the Montreal Spur, and his wife returned to their rooms after an early dinner. They found one of their trunks open and a jewel case containing gems and cash missing. The total value of the items stolen was around $10,000. Detectives suspected the guest who was registered in the room next door, whom The Times described as a “swarthy, stocky man of about 30 years.” When the hotel intercepted a telegram from the man’s wife with a return address in upstate New York, the police were on his tail. In 1942 nothing had changed other than a new electric sign. Although the 31st Street neighborhood experienced a decline after the middle of the 20thcentury, and the Wolcott along with it, the area revived with the beginning of the 21st. The hotel underwent an extensive renovation and restoration of the façade, bringing the rooms onto par with modern hotels while retaining the grandeur of James Breslin’s 1904 showplace. Bay windows add dimension to the facade, rising to immense carved faces, swags, and a cartouche reading "WOLCOTT."